Whether you ride this bull market or stay on the sidelines is not a matter of brilliance, but of risk management. To illustrate, we look at lessons to be learned from the “greatest predictor” of market returns (hint: it isn’t). Nobody knows whether the market is going to plunge next year, but anyone who fears that it might may be well served taking that that into account, as staying fully invested presumably implies taking on more risk than one is comfortable with. The short of it: if you were concerned about valuations in March 2000, your fears were warranted, even if someone tells you, don’t worry, in the long-run, you’ll be just fine. Incidentally, if you look at the advertising of some advisors, they boast of their “long term” track record post 2008. In the opinion of yours truly, and as I believe this little exercise illustrates, you should take any such boasting with a grain of salt. Now imagine you knew the exact return an investment in the S&P 500 would give you over 10 years. Imagine you were in March 2000, November 2007 or March 2009 with such perfect forecasts. Or take any other day, as mundane as such a day might have been, how would you decide to allocate money over the next 10 years with perfect foresight? This isn’t such an abstract problem, as we are faced with a long-term investment decision every day. 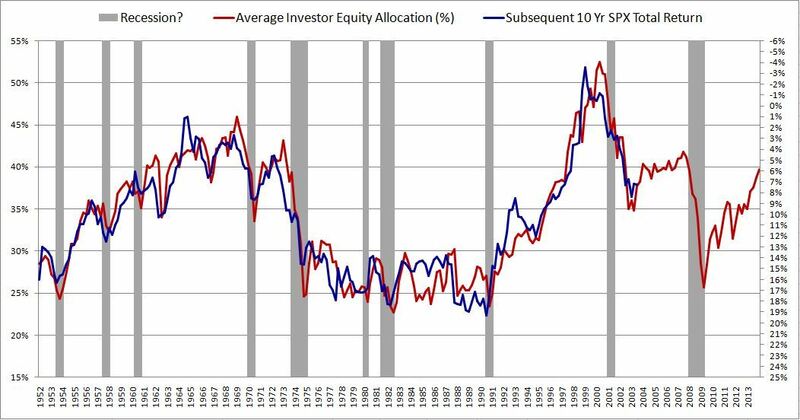 The chart, taken directly from the article, shows average investor allocations to equities from 1952 through 2013 (left scale), then the subsequent 10 year returns in the S&P (right scale). The average investor allocation is a series from the St. Louis Federal Reserve, published quarterly. Note that the ‘subsequent 10-year return’ line is offset by 10 years, thus ending in 2003, i.e. 10 years before the study was finished. To make this more than a pretty picture, we need to a) address potential pitfalls of this approach, if any; and b) convert this predictor into an investment strategy. Today, we aren’t merely working with perfect foresight, but also with perfect hindsight. First, there is the issue that now, decades later, we know this chart can be fitted to look like it might predict 10-year returns. That’s a danger with just about any market predictor; in this case, I can live with it as it makes economic sense: high current demand for equities by investors leads to lower future returns and vice versa. More troubling is that the curve was indeed fitted with hindsight. If one is to implement a strategy, one should build up a predictor that only uses past data for calibration. And then there is the issue that this time series is not available at quarter end, but these days with a delay of approximately 10 weeks. We haven’t resolved how long the delay was decades ago, but one obviously needs to introduce an appropriate lag in deploying data. If you dive into the data, you will notice that this measure of “average investor equity allocation” is a ratio of the market capitalization of equity investments divided by the sum of the market capitalization of equity, fixed income & cash investments. That is, when you look at the markets as a whole, investors, net, don’t “sell” equities (for every seller, there must be a buyer), but the value of equities change. But what it also means is that you do not need to wait for 10 weeks for the St. Louis Fed to go come up with their metric. You can approximate the index using live market data. Indeed, we calculated a statistically highly significant correlation of the “predictor” and the S&P, meaning you might as well use the S&P to predict the S&P. 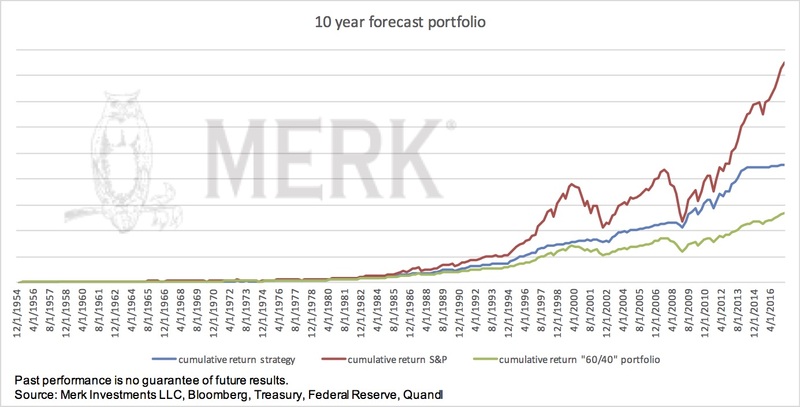 Each quarter, I calculate a new target 10-year return. Every quarter for the next 10 years, I designate 1/40th of the portfolio to a sub-strategy, let’s call it a bucket: I track whether the S&P is below or above the target for this particular bucket. If I am more than below the target by some measure, meaning the market will have to catch up by the end of the 10-year period, I buy the S&P for this bucket; if I am above the target by some measure, I invest that bucket in 3-month Treasury Bills. The chart is from December 1954, but now extends to September 2017; the strategy shown above is, on average, less than 50% invested. As one can see, in recent years, the strategy has been defensive, under-performing both the S&P, as well as a 60/40 portfolio. This strategy - by design - reduces exposure during extended bull markets, then increases investments in downturns. In the multi-decade period chosen, it outperforms a 60/40 portfolio (but under-performs in recent years). Importantly, for the trading thresholds chosen (as well as a reasonably broad range of other thresholds tested), the volatility of returns is in the same order of magnitude as a 60/40 portfolio, meaning it has a higher risk adjusted returns (a higher Sharpe ratio). Wait a second: if the specific model chosen has a higher Sharpe ratio, is it superior to a 60/40 portfolio? Yes and no. The risk/return profile has little to do with some magic predictive power of the St Louis Fed data, and how we have converted it to result in buy/sell signals, but much more to do with the fact that any mean-reversion approach is likely to outperform in an oscillating market, but under-perform in a market driven by momentum. That is, you tell me the market we will be in, and I’ll tell you whether my strategy will outperform. Why I’m drawn to this approach to rebalancing a portfolio is not because this model has any predictive power – it may not. But because the approach ultimately suggests lightening up when many – including yours truly – have felt the markets have been expensive. To me, if I can achieve comparable results to a 60/40 portfolio at acceptable risk, it is an exercise worth pursuing. Importantly, this approach could provide guidance for getting back into the market for those that have been on the sidelines. One more word about the bond portion (the “40” in 60/40) in a balanced portfolio. My preference is to think of this portion as that allocated to non-correlated assets. Too often I see investors chase yield in their bond portfolio these days; for those that do, note that by chasing yield, you are converting these investments into risk assets, as they may well rise and fall in tandem with your equity portfolio. I welcome feedback on this exercise; and let me know if you would like to have practical help on ways to actually implement a risk management strategy on an ongoing basis. If you were looking for an outlook not for the next 10 years, but for the next year, don’t despair. We don’t have a crystal ball, but that doesn’t mean we don’t have an opinion. We will discuss those in our December 12 outlook webinar (click to register). We will also give you food for thought for the global macro environment in the era of a Powell Fed. And if you are interested in a behind the scenes look at the sort of data we look at in our research meetings, we are working on a special report to share with those interested.